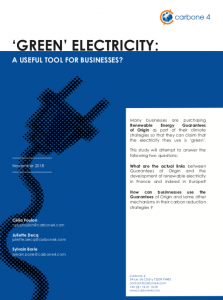 HomePublications-ENPublications internes-EN“Green” Electricty : A useful tool for businesses? “Green” Electricty : A useful tool for businesses? As part of their climate strategy, many companies purchase renewable-origin guarantees that allow them to claim “green” electricity consumption. What are the effective links between guarantees of origin and the development of renewable electricity in France and in Europe? How to understand the place of these guarantees of origin and other mechanisms existing in the strategies of reduction of emissions of greenhouse gases for a company?